Today I started this hashtag #oneTweetBookProposal and now @tmccormick made @1TweetBookProps and I can't tell if he's serious or not. @ibogost I'm serious, because this is funny. It's #agile #literature. @ibogost @tmccormick @1TweetBookProps Pitch it quick and sell it fast! @subliminalman @ibogost @tmccormick pitch it!? to whom? I'm doing it. Publishers? We don't need no stinkin' publishers! @subliminalman @ibogost @tmccormick "Kickstarter? ": phaps. I was thinking to simply explore how fast/easily I can get it up for sale myself. Seems @tmccormick is actually trying to profiteer #OneTweetBookProposals, http://t.co/ogmqFBqewm. I still can't tell if he's joking? @ibogost Is @tmccormick working with you on @1TweetBookProps? Where are profits going? Nyasha Junior is Assistant Professor of Hebrew Bible/Old Testament at the Howard University School of Divinity, Washington D.C. Blog @NoExtraCredit, Web nyashajunior.com. @ibogost @NyashaJunior If only he had included that Tweet from Ed O'Bannon, we could have us a real legal shindig! @NyashaJunior @tmccormick @1TweetBookProps In true Silicon Valley fashion, into his greedy, sweaty hands. What a douchebag. @ibogost @tmccormick August 13, 2013? Is this guy a time traveller? [note: I'd mistakenly put "August 13" in the the ebook description on Gumroad.com book page]. Catherine Liu is Director, UC Irivine Humanities Center, Film & Media Studies, and Professor of Film & Media Studies. Author of The American Idyll: Academic Anti-Elitism as Cultural Critique. [from UCI faculty page]. @cliu_uc @tmccormick The future comes sooner in Palo Alto. @ibogost "We enable thousands of creators to make millions of dollars." Josh Honn is Digital Scholarship Fellow at the Center for Scholarly Communication & Digital Curation, Northwestern University, where he consults and collaborates with faculty and graduate students on digital humanities pedagogy and research projects. (from joshhonn.com). “We enable thousands of creators to make millions of dollars” is the current tagline of Gumroad, the site on which the “One-Tweet Book Proposals” ebook was offered for sale. @joshhonn Pretty sure they mean, "We enable thousands of creators to make us millions of dollars." @ibogost Precisely; and by creators, they of course also mean "curators." @ibogost D ibogost I know Tim McC. from college. He's not a greedy douchebag. Just sometimes an overzealous fan. Elizabeth Goodman is a designer, researcher, and writer on interaction design and ubiquitous computing living in San Francisco. She is currently a PhD candidate at UC Berkeley’s School of Information. (from her site Confectious.net). @egoodman Maybe he's just a lousy one. A truly effective greedy douchebag would have chosen a more marketable target! 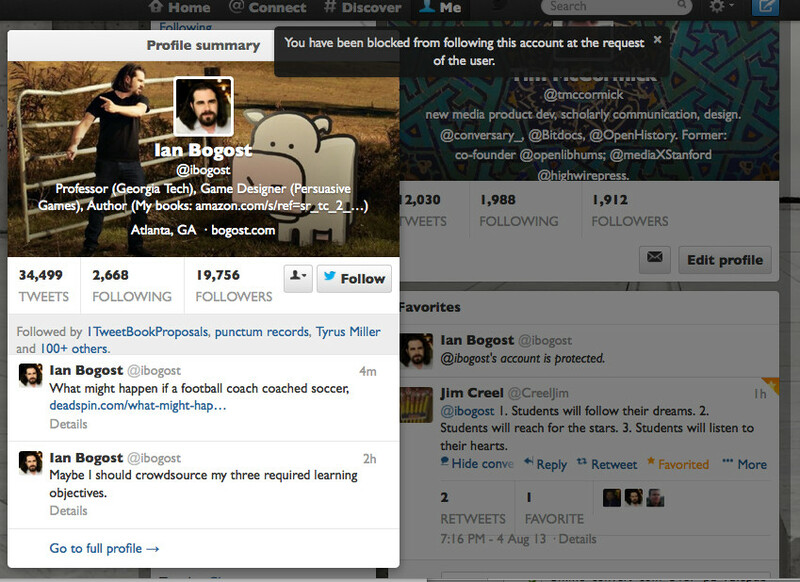 As of 9:30am PST, Ian Bogost’s twitter account @ibogost is apparently blocking my account @tmccormick, meaning I cannot message him there, or see his postings in my home timeline. @tcarmody Quick, write a #OneTweetBookProposal for "Golf for the Soul" so that @tmccormick can steal it. So far on Sun 04 July (to 11:20am PST), 14 new “One-Tweet Book Proposals” have been posted via #onetweetbookproposals. @tmccormick @blairmacintyre @nyashajunior @cliu_uc @joshhonn @egoodman I never blocked your account. Change that now. I never blocked you on Twitter. Claiming others work as yours by putting your name on it is one kind of assholery. Slandering me directly is another. Fix it. I never blocked you on Twitter. Are you lying about that as part of your perverse trolling experiment, or do you actually believe it to be true? Response: I observed (in post above) that account @ibogost apparently blocking account @tmccormick, because @ibogost posts in conversations were showing up as unavailable/”protected,” as shown in screenshot. (Note, I said “account” deliberately rather than Bogost because it is possible that blocking could be done by error, algorithm, or Twitter administrators). @tmccormick Perhaps it was a Twitter weirdness. Perhaps you Photoshopped those images. I have no idea who you are or why you are doing this. @tmccormick I'll give you a chance to just tell me now. What is it you are trying to accomplish? @ibogost I was doing an experiment in Twitter archiving & rapid ebook publishing. @ibogost as it happens, I'm also intrstd in academic-public interactions, e.g. open access & public scholarship, and commenting/discussion. @tmccormick Even if that's the case, you come off as a total creep. Can you understand that at all? @tmccormick Also, please remove my email address from your weird, deranged postings of Disqus comment updates. @tmccormick You have a very, very strange way of showing your interest. @ibogost perhaps. But I'd think you wouldn't have such a problem with strange, per se. @tmccormick There's strange as charmingly/challenging curious and strange as just creepy. You're the latter. @ibogost well, ok, it's your view. To me, it's remarkable to publicly write such things when, as you noted, you have no idea who I am. @tmccormick This is the point where a normal person would apologize, take down the posts, and move on. Will you do that? @tmccormick To write what? To tell you that you that you are making me uncomfortable, that I find your behavior disturbing? @tmccormick You created a relationship of distrust with me. You delivered on that distrust. Now I'm at fault for finding you untrustworthy? @tmccormick Let's bracket the publishing project, which I find immoral and craven. Your blog & tweets are disturbing. They feel threatening. @ibogost I'm sorry you feel that way. I don't know in what way I could be threatening you, & since it's all public, others can assess. @ibogost @tmccormick I agree with everything Ian's said on this thread. Further more, how does one unsubscribe from an "open experiment"? @tmccormick I don't think it's productive for us to interact any further. I hope you'll remove your blog post and cease your experiment. @tmccormick @gleemie You don't know me, but as a Twitter bystander, I sympathize w/ @ibogost. Your ebook is predatory and just plain weird. @tmccormick Glad you find the conversation useful. I just wanted to express that I found your "experiment" offensive and silly. I'm done. @tmccormick Creative Commons suggests that people make things for free w/expectation that unanticipated derivative work be non-profit. While I am sorry that @ibogost is going through this, I think this episode is a lovely illustration of the exploitation of "openness"
@gleemie I think CC today inclines fairly strongly to a free-culture, CC-BY view which explicitly allows commercial reuse. @tmccormick at most basic level, did you think people would have no problem that you were maybe making profit from their words? @gleemie think tweets have often been included & collected into books. They’re published for reuse, eg RTing, & prob not (c)able b/c length. @gleemie I didn’t have a particular view on that. I do experiments like this to in part learn what people think. @gleemie I'd actually think, from your work, you might sympathize with efforts to get compensation from informal digital work. @tmccormick yes I would sympathize if the people being "curated" were also being compensated. @gleemie huge portions of all knowledge work is not compensated directly: eg FOSS, Wikipedia, most scholarship, #CHI2013 Proceedings papers. @gleemie I might argue it's worse for a publicly-funded researcher to not make their work public. I didn't take any money, block any access. @tmccormick researchers are fighting that fight in diff ways. Hashtag tweeters did work in public! And then you privatized the work again! @tmccormick okay. Well since it seems like you aren't really taking any of this on board, back to reading about coding on periphery for me. "Complete Guide to The Seven People Who Paid for The #OneTweetBookProposals PDF (includes name, email, cellphone, home address, and more!)" 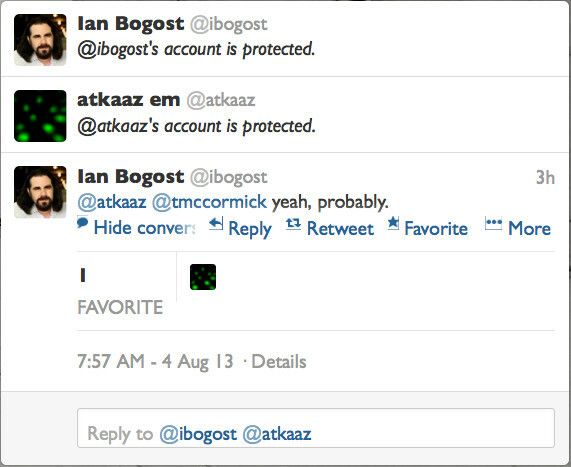 Update 04 Aug 2050PST – confirmed @tmccormick account blocked by @ibogost. See screenshot below – click on to view full-size. Note: @ibogost has 19,756 followers. The “followed by.. 100+ others” indicates we have over 100 mutual followers, who would see in their timelines not only regular tweets but any reply message (i.e. prefaced by @username) between Bogost and me. This list is primarily academics, journalists, writers, and media sources in higher education and digital humanities. Update 04 Aug 2200PST – changed price for “One-Tweet Book Proposals” ebook on Gumroad from 99¢ to free. Note, I set up the ebook with a 99¢ price on Gumroad and made one purchase to test the mechanism, but it was subsequently turned it off and never accepted a payment from anyone else. I am interested to see if people have concerns with tweet collection in the case of an ebook (PDF) offered at no charge. It could be seen as a type of “storify” collection, blog post, or book. I am also continuing to experiment with various ways to present Tweet series as compound “long form” works. What do you think? In what ways might be acceptable or useful for your tweets to be collected? Please comment using Disqus box below (connect w/Twitter, Facebook, G+, or Disqus account), or on Twitter with a link to the post and/or me @tmccormick and/or hashtag #onetweetbookproposals, or email me at tmccormick (at) gmail.com.